Do you have the attitude, skills, and plan to fight off this kind of attack? Multiple attackers in a small space? This is what Active Self Protection is all about, handling real danger like this. What does this unprovoked attack teach us about self protection? If you can win “the fight before the fight,” you win. You win that fight by minimizing your potential for being attacked in the first place! That means making smart decisions and living a life of awareness and readiness so that you don’t take unnecessary risks. If you choose to wear expensive jewelry (which might not be wise, but might be understandable in some professions) you better be ready to protect it and yourself from attack because of that value! Empty-handed skills are absolutely critical for self-defenders. First of all, more conflicts you will encounter as a self-defender will require empty-handed skills than will require firearms skills, simply because more self-defense encounters are physical than deadly. Second, since a firearm is a tool of last resort, self-defenders need to have non-lethal options that include empty-handed skills to protect themselves from likely incidents. Third, in the moment of the encounter you may not have the time to get to your gun before you can fight your way to it. We must never settle for being able to protect ourselves against a lone attacker because of how common multiple attacker engagements are. Rats travel in packs, so we must always be prepared to face multiple attackers! You must be able to fight and defend yourself from all different stages of action. One of my martial arts mentors, Skip Hancock, likes to say that we must be able to fight wherever the fight happens to be! So whether we are at contact stage (just able to come in physical contact with our attacker), penetration stage (where attacks can contact and penetrate significantly), or manipulation stage (a clinch or similar where joint and body manipulations are possible), we must be able to use effective technique to protect ourselves. 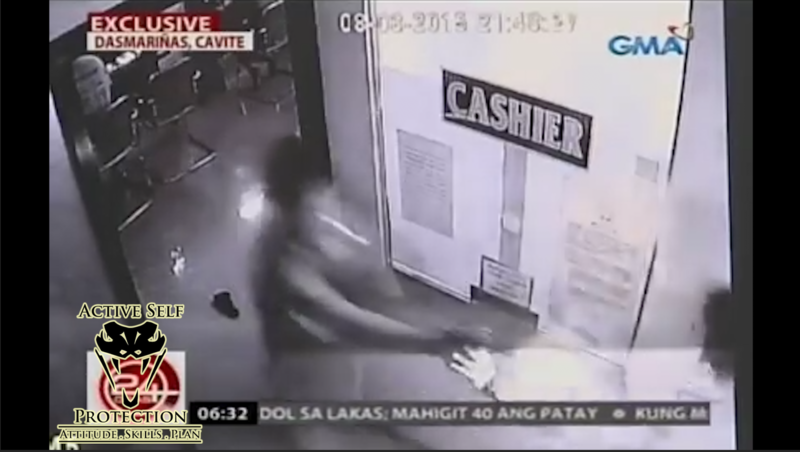 You Decide: Was This Self-Defense Against Armed Robbers or Murder? 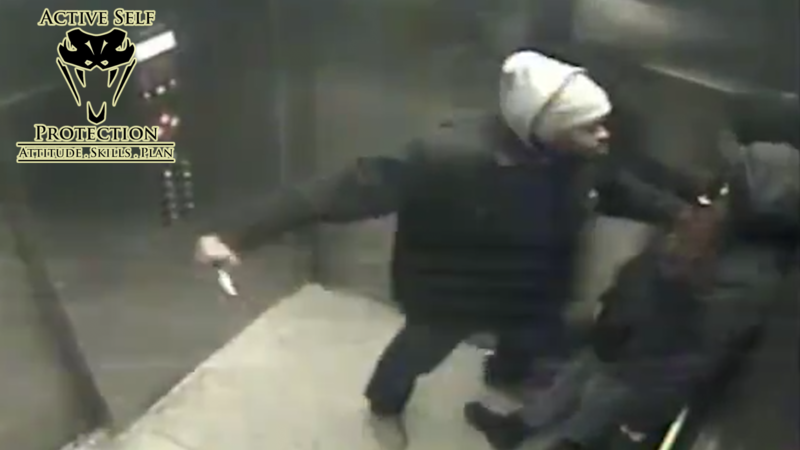 Honest question for you: was this self-defense, or was it overstepping into murder? It’s an important part of Active Self Protection to think through what we would do if armed robbers attacked us, and when we have to break contact and not pursue anymore. This video makes us think about it! What does this general teach us about surviving an armed robber attacking you and not ending up in jail yourself? One of the five pillars of lawful, moral self-defense is “imminence,” (get a nutshell here: http://get-asp.com/wbbp or the whole concept here: http://get-asp.com/1fqe ). Imminence means the threat is happening RIGHT NOW, that it’s neither too late nor too early for you to defend yourself! The standard of imminence is seen as a triad of ability, opportunity, and jeopardy (also known as the AOJ triad, which is explained here: http://get-asp.com/pm3k in some detail). In this instance, the shots the general took don’t meet the standard of imminence; the threat was over and his actions were too late to be called self-defense. Situational awareness is your best friend. It doesn’t mean that you always are paranoid or living in “condition orange,” but it does mean that you know Col. Cooper’s color code of awareness and you live by it. Pay attention to your surroundings, and recognize that when you’re in public places you need to be more aware of your surroundings than when you’re in private. https://activeselfprotection.com/wp-content/uploads/2016/03/Screenshot-2016-03-10-19.54.16.png 1286 2284 John Correia https://activeselfprotection.com/wp-content/uploads/2018/03/ASP-Logo4-300x111-300x111.png John Correia2016-03-10 19:59:522016-03-10 19:59:52You Decide: Was This Self-Defense Against Armed Robbers or Murder? I wish that every video we received was a happy ending. This one is not. This is why we train and encourage EVERYONE to practice Active Self Protection in their life, and hope that even in brutal attacks by a terrorist like this, we can learn lessons and redeem evil. 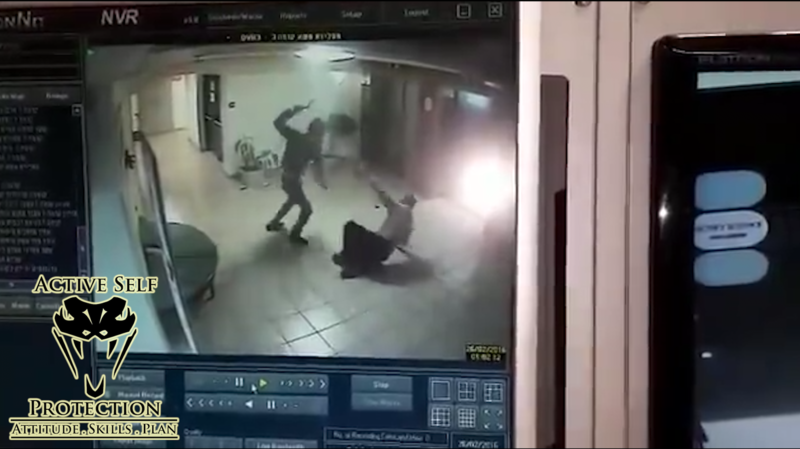 Original video of the terrorist attempting to murder the guard, with news story and details: https://get-asp.com/2v5r The terrorist has been caught. What does this attack by a terrorist teach us about surviving an attack? You must accept that danger exists and that it can happen to you. This is the foundational core of spiritual fitness and the first step in taking proactive steps to protect yourself and your loved ones. If you live in a fantasyland that nothing bad can happen because nothing bad has happened in the past, you’re setting yourself up for a terrible letdown. This attack came out of nowhere, and the news story says that the guard and the terrorist knew each other at least marginally. But danger still exists, and you must be ready for it. If your awareness is solid, you should get plenty of pre-attack cues from a robber or other attacker. If you’re paying attention to your surroundings and the people in your vicinity it becomes a lot easier to see who is out of place! Look for people lurking and not doing what everyone else is doing, or covering their face or head when that’s not necessary (like inside or when it’s warm out). Watch for furtive glances which are an indicator that they are looking for potential witnesses to their actions. Check hands as well to see if they have anything in them or are hiding unnaturally in pockets. If you see a pattern that makes you uncomfortable, move from condition yellow to condition orange and take action to investigate or move to safety. 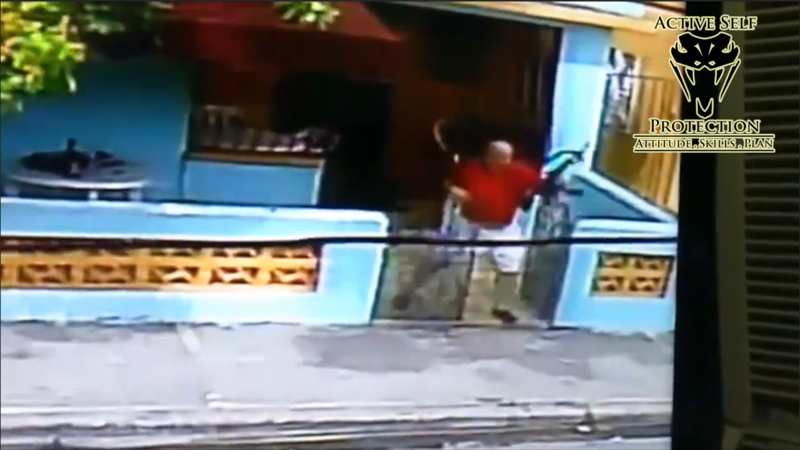 The guard here turned his back on his attacker and that gave him a complete ambush. There is a significant difference between territorial and predatorial violence. (I learned these terms from Marc MacYoung) Territorial violence occurs when an aggressor wants something from you; they put a line in the sand and tell you that you will give it to them, or they will hurt you. Muggings and rapes fall in this category among others. Predatorial violence occurs when the attacker wants you dead and there is no ability to comply with demands to live. In territorial violence compliance might get you out alive, but a predatory attacker will not be stopped short of your death or you having the attitude, skills, and plan to stop them. As one of my martial arts mentors, Skip Hancock, is fond of saying, the ground must be your friend and not your enemy. You must know how to fight on the ground and not panic if the fight goes to the ground! You must have skills from bottom position, from top position, and in the scramble. You must be able to regain your feet and fight from wherever you find yourself. Too many fights require this skill to ignore it! Spiritual fitness is an important part of Active Self Protection. You don’t often get any advance notice of the last day of your life, but we see over and over that self-defense isn’t a guarantee of winning every fight you might be placed in. You want to be at peace with your loved ones and with God, because you’ll need that peace on the day that you meet Him. Since you can’t guarantee advanced notice, make peace today. Even if you’re injured, you must stay in the fight and not stop as long as you have consciousness. The human body is designed to take a ridiculous amount of injury and still function, so never stop fighting just because you’re injured! Even if you’re shot or stabbed, you have a 67-95% chance of surviving! (https://get-asp.com/ew3l and https://get-asp.com/p0hn give the details) So practice emotional fitness by knowing that even if the bad guy gets the jump and you’re injured, you’re still in the fight and still likely to survive if you take definitive action to protect yourself. This kind of attack makes me SO angry. Like seriously. This is why we teach Active Self Protection to people, to be able to protect yourself from evil like this. How would you have protected yourself in this scenario? What does this attack teach us about self-defense against a knife attack? If your awareness is solid, you should get plenty of pre-attack cues from a robber or other attacker. If you’re paying attention to your surroundings and the people in your vicinity it becomes a lot easier to see who is out of place! Look for people lurking and not doing what everyone else is doing, or covering their face or head when that’s not necessary (like inside or when it’s warm out). Watch for furtive glances which are an indicator that they are looking for potential witnesses to their actions. Check hands as well to see if they have anything in them or are hiding unnaturally in pockets. If you see a pattern that makes you uncomfortable, move from condition yellow to condition orange and take action to investigate or move to safety. If you know there might be danger around, you cannot stand there flat-footed with your hands at your side. That’s a great way to die. Instead, if you think danger might be coming but not imminent, get your hands up protecting your head, neck, and chest. I do this by tucking one hand under the other elbow, and the free hand on my chin as if I were in deep contemplation. Others do it using the “interview position” with both hands as if they’re holding a pad and pen. Getting your hands up shaves split seconds off of your reaction time, but that might make the difference between life and death if you can prepare. First aid skills are important. If you’re going to train and prepare to take a life to defend yourself, you should also have skills, training, and equipment to save life should you need to. (I carry an individual first aid kit at a minimum: http://amzn.to/1Or4yVz ) Often that will not involve defensive encounters, and in a defensive encounter your primary responsibility is to yourself and your loved ones. Fights are physically demanding. Sure, a pure gunfight might last 10 seconds and not place a huge burden on you physically, but the vast majority of encounters we see here at ASP involve physical self-defense as well. Getting into a honest-to-goodness fight with someone is incredibly physically demanding, so being physically fit is an important part of maximizing your chances to protect yourself. Fit people are harder to beat and harder to kill! How would you have handled the first attack? I think the second one was probably easier from an Active Self Protection standpoint, but the first one is not so easy in reality! News story with details of the incidents: https://get-asp.com/q99w note that the weapon in his hand in the first attack was a metal shelving pole, and that he was clearly delusional at the time of the attacks. What do these attacks teach us about protecting ourselves from random violence? Evil exists in our world, and no amount of wishing it away does so. Evil people do evil things, and good people must be ready and willing to stand between them and innocent people and do enough violence to stop them definitively. No amount of negotiation will make truly evil people change their ways; only those willing and able to stop them who use attitude, skills, and plan effectively can. Since criminals are looking for victims and not fights, they tend to look for vulnerable people to target. Think about a pride of lions chasing wildebeest in Africa and you get the picture. They target the elderly, the young, and the sick for easier attack and greater success. Likewise, criminals pick victims who they think will not effectively resist them, or that the criminal can quickly overwhelm. This includes the elderly, the young (kids and early teens), the sick, and the distracted. Men (the overwhelming majority of attackers) also target women because women tend to be physically weaker than men. If you’re in a vulnerable population take extra precaution and train! As well-meaning as police officers are, they cannot protect you from danger. As the old adage says, “When seconds count, the police are only minutes away!” You—and ONLY you—can protect yourself from danger when it comes upon you. A police response time of 5 minutes is considered perfectly acceptable in most suburban departments, and times upwards of 30 minutes can be the norm in rural areas! You need to have the attitude, skills, and plan to protect yourself from harm because the police simply can’t. As one of my martial arts mentors, Skip Hancock, is fond of saying, the ground must be your friend and not your enemy. In the second attack, the victim used the ground pretty well. You must know how to fight on the ground and not panic if the fight goes to the ground! You must have skills from bottom position, from top position, and in the scramble. You must be able to regain your feet and fight from wherever you find yourself. Too many fights require this skill to ignore it! Many attackers use their support or guard side arm as a leveraging tool, holding their opponent with it either to guard their strong hand (with a force multiplier in it, often) or to put their intended victim at the preferred distance for their dominant hand to strike with maximum effect. It gives them leverage, which is why we call it a leveraging arm. You have to train repeatedly as a self-defender against the leveraging arm so that you can deal with it before the dominant arm comes into play. What does this revenge rundown teach self-defenders about lawful self-defense? One of the five pillars of lawful, moral self-defense is “imminence,” (get a nutshell here: http://get-asp.com/wbbp or the whole concept here: http://get-asp.com/1fqe ). Imminence means the threat is happening RIGHT NOW, that it’s neither too late nor too early for you to defend yourself! The standard of imminence is seen as a triad of ability, opportunity, and jeopardy (also known as the AOJ triad, which is explained here: http://get-asp.com/pm3k in some detail). We must each decide what is worth protecting. Life is always worth protecting because it is of inestimable worth; as unique bearers of the image of God, people are the most valuable “thing” imaginable. Property is something else, though. With property we always have to balance the benefit against the risk to ourselves and our families. Even where it’s legally allowed, you should consider whether it’s wise or prudent to defend your property, because doing so puts you at risk and not just the bad guy. If you can win “the fight before the fight,” you win. You win that fight by minimizing your potential for being attacked in the first place! That means making smart decisions and living a life of awareness and readiness so that you don’t take unnecessary risks. It means knowing that Craigslist transactions are inherently dangerous, and therefore doing them in public, safe places like police stations or the mall. It means not allowing strangers to get into your car. The human body is designed to take a ridiculous amount of punishment and still function. You can run someone over with your car and they can still pose a deadly threat! Even mortally wounded people can continue to pose a threat for several seconds to even minutes after being injured, so don’t think for a moment that injuring someone will necessarily immediately incapacitate them. That is Hollywood myth. Think about this from the perspective of your costs. Okay, the guy won’t steal from people again probably. Great. But to get your $190 shoes back, you did $4000 in damage to your car that your insurance company won’t cover. So don’t say it’s about protecting your livelihood when you just threw $3800 down the drain! Then, you have to pay for the impound on the car and your stuff, which will be hundreds more. Then you have to hire an attorney for $450+ an hour to defend you in court, so that’ll be MINIMUM $5000 if the DA is your best friend. It could be $100,000. At the end, even if you get a jury that decides on jury nullification (because if not he’s going to be behind bars) you get to lose your house for that $190. And if you don’t get everything 100% right, you spend 5-10 years behind bars, lose your ability to love your family, and your livelihood. Stupid, isn’t it? Honest question: do you use your mobile like this in public? Think about what that means to your Active Self Protection, how it impacts your ability to know your environment, and see how close someone can get to you before you realize it! What does this assassination teach us about protecting ourselves while in public? Situational awareness is your best friend. It doesn’t mean that you always are paranoid or living in “condition orange,” but it does mean that you know Col. Cooper’s color code of awareness and you live by it. Pay attention to your surroundings, and recognize that when you’re in public places you need to be more aware of your surroundings than when you’re in private. This assassination happened when and where it did because the assassin saw an opportunity where the victim wasn’t aware enough to give him a chance to survive the blast. Transitional spaces are places where we MUST be more careful of potential attack. A transitional space is any location that (1) allows attackers to prey on potential victims with an element of surprise and (2) provides ready escape for the attackers. The victim here got caught unaware in a transitional space (a sidewalk) where the assassin could hide from him until the moment of attack. If your awareness is solid, you should get plenty of pre-attack cues from a robber or other attacker (even from an assassination attempt). If you’re paying attention to your surroundings and the people in your vicinity it becomes a lot easier to see who is out of place! Look for people lurking and not doing what everyone else is doing, or covering their face or head when that’s not necessary (like inside or when it’s warm out). Watch for furtive glances which are an indicator that they are looking for potential witnesses to their actions. Check hands as well to see if they have anything in them or are hiding unnaturally in pockets. If you see a pattern that makes you uncomfortable, move from condition yellow to condition orange and take action to investigate or move to safety. 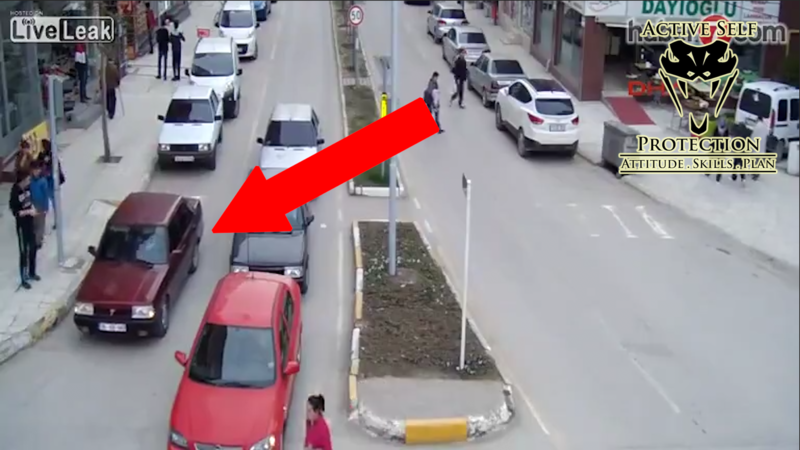 The red car was hanging out where it was out of place in traffic, and that was a clue if he was really on top of things! Your mobile phone is a useful tool but a dangerous one. It can be used to communicate, to get emergency help to you, and to avoid problems altogether in numerous ways. It can also be a very dangerous distraction, because it is designed purposefully to grasp our undivided attention and hold it. When in public, use your mobile sparingly and correctly. Don’t allow it to hold your attention for more than 20-30 seconds at a time, and hold it high so that your head is up and you can see past it to what is going on around you. It was a significant part of this assassination because the victim was totally engrossed in his phone until it was too late. First aid skills are important. If you’re going to train and prepare to take a life to defend yourself, you should also have skills, training, and equipment to save life should you need to. (I carry an individual first aid kit at a minimum: http://amzn.to/1Or4yVz ) Often that will not involve defensive encounters, and in a defensive encounter your primary responsibility is to yourself and your loved ones. I carry my IFAK for myself and loved ones as well as to aid victims, and I have had to use it on bleeding people (from car wrecks in my case). Get some first aid skills! 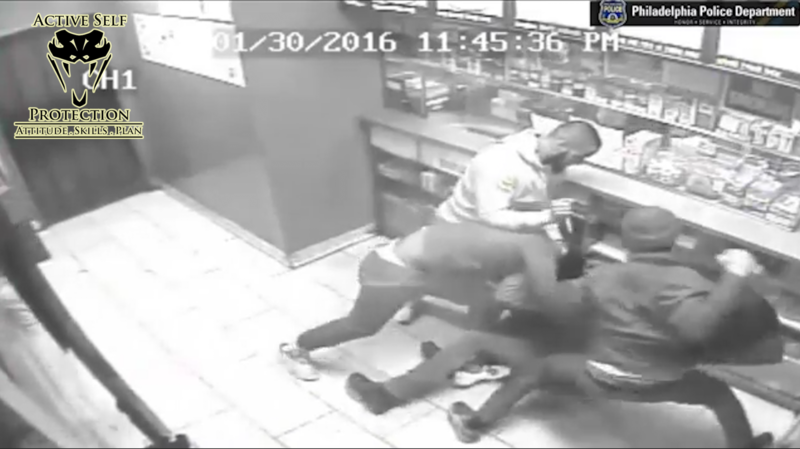 This is real-life and armed robberies like this assault happen on our streets. I hope your Active Self Protection is up to the task when the moment comes, but recognize that THIS is what you may need to protect yourself from. What does this video teach us about protecting ourselves from multiple attackers who assault us? Transitional spaces are places where we MUST be more careful of potential attack. A transitional space is any location that (1) allows attackers to prey on potential victims with an element of surprise and (2) provides ready escape for the attackers. When you’re in a transitional space like a convenience store you must be ready, because that’s where you’ll run into an armed robber if you ever do! Empty-handed skills are absolutely critical for self-defenders, even against multiple attackers. First of all, more conflicts you will encounter as a self-defender will require empty-handed skills than will require firearms skills, simply because more self-defense encounters are physical than deadly. Second, since a firearm is a tool of last resort, self-defenders need to have non-lethal options that include empty-handed skills to protect themselves from likely incidents. Third, in the moment of the encounter you may not have the time to get to your gun before you can fight your way to it. The Five Ds are a tool that we use at ASP to organize our training and preparation for defending ourselves against an armed attacker when we are not armed ourselves. (or if we are armed but outdrawn such that we must deal with the problem with our hands) Deflect, Dominate, Distract, Disarm, Disable. We pursue them from first to last, in order, to give us the best chance of successfully defending ourselves against an armed opponent. Deflect their force multiplier, Dominate as much as possible (best is the whole person, second is the arm with the tool, last is the tool itself), Distract the attacker (usually using pain, redirection, movement, etc. ), Disarm the attacker, and Disable the attacker. While we certainly recommend that people carry the best defensive tools they possibly can, there will be times when those tools are unavailable. In those instances, though, being aware of any environmental weapons of opportunity you might use to defend yourself is helpful! A glass bottle can become a very nasty slashing tool (or, as against this armed robber, a great bludgeoning tool!). A pen can be used as a makeshift kubotan. A wrench can become a workable fighting stick. Don’t discount environmental weapons if you don’t have access to purpose-built tools. Would you have been able to protect yourself after the initial attack here? I don’t think that every attack is preventable, and even practicing Active Self Protection isn’t proof against being ambushed. But this stabbing shows us that our response to the ambush is important, and even life-saving. 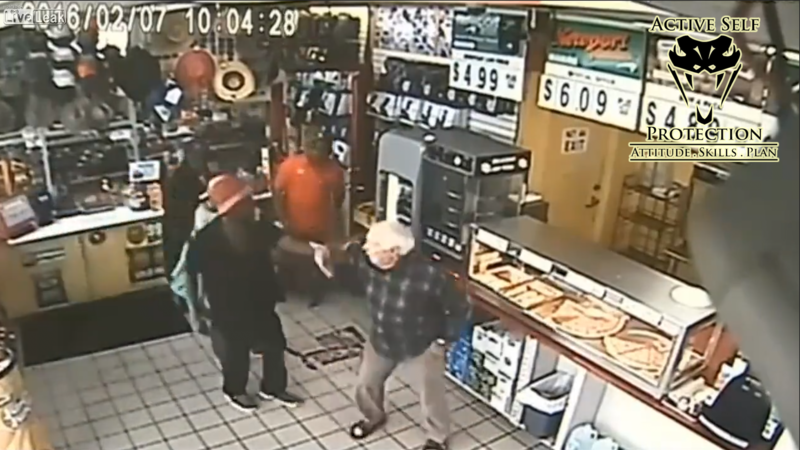 What does this video teach us about protecting ourselves from a stabbing? Knife attacks do not happen like you’ve seen in Hollywood. They are brutal, fast, and mean. Stabbing attacks do not generally come from slashes or from any notice whatsoever, but tend to come from concealment and repeatedly stab at a rate of 2-3 stabs per second. If you don’t have a force multiplier in the fight but the attacker does, to defend yourself you must know how to close the distance to get your hands into the fight. A firearm has significant distance advantage, and a smart attacker will keep it out of range from your hands. If you do choose to fight back, you MUST close the distance to get the gun out of the fight before he can use it against you. That usually will involve feigned compliance and redirection as well as waiting for the right opportunity to move. First aid skills are important. If you’re going to train and prepare to take a life to defend yourself, you should also have skills, training, and equipment to save life should you need to. (I carry an individual first aid kit at a minimum) Often that will not involve defensive encounters, and in a defensive encounter your primary responsibility is to yourself and your loved ones. 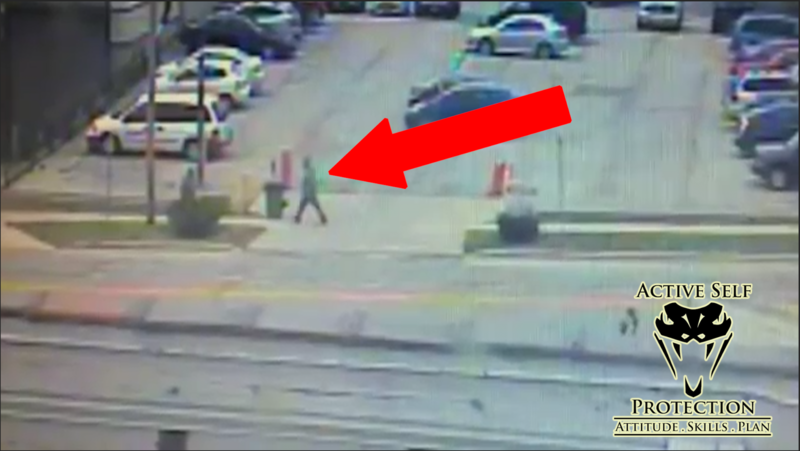 Sometimes the most effective self-defense is counter-intuitive, as this security guard being murdered shows. At Active Self Protection we just want people to have the best chance to survive whatever comes their way, and an ambush like this is a possibility for any of us. 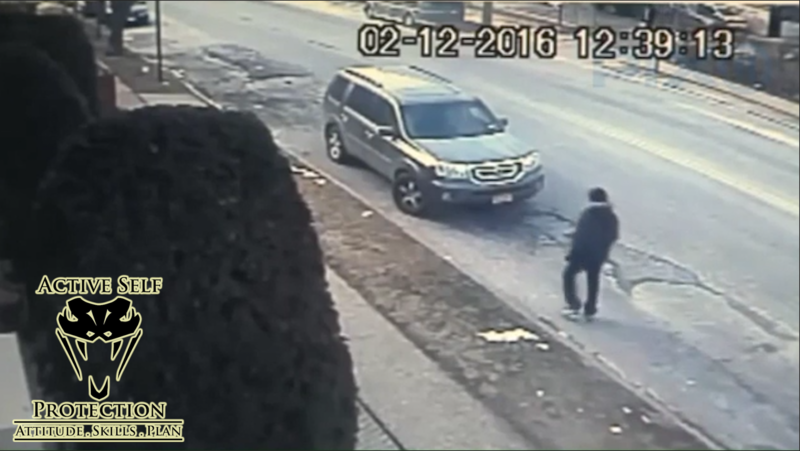 What does this video teach us about protecting ourselves from an ambush? In any territorial or predatorial violence, the attacker gets to set the time and circumstances of the attack. They will almost always launch that attack from ambush, or as we like to call it in Umas, from “obscurity.” Surviving that ambush is one of the most important keys to successfully defending yourself.